When I want to let someone know I appreciate them, or welcome someone into the neighborhood, I always give them food – usually homemade bread or treats. Partially because I just like baking and partially because homemade food is what I’d want someone to give me. But I can’t tell you how many times I’ve baked a loaf of bread and tried to deliver it to someone, only to have them not be home. And then the fresh hot bread I made cools off and gets a little less delicious. And because I’m perhaps more prideful than I should be about my baking…I just don’t want to give away the bread that’s not warm anymore, and I’m certainly not going to give it to someone the next day when it’s already practically so stale it’s inedible. I know – big problems here, right? 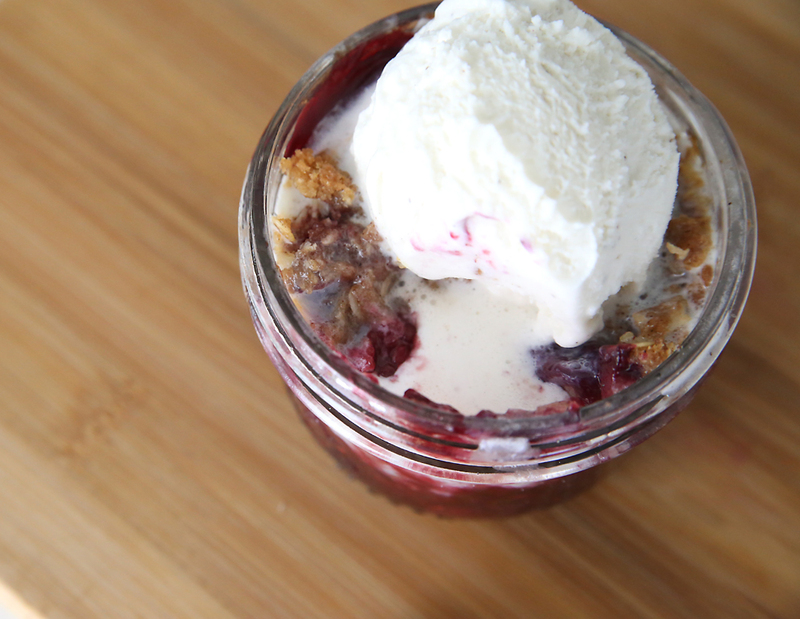 A few years ago I came across the idea of giving someone a frozen mini pie in a jar that they can bake whenever they want, and I thought it was genius. I can keep mini pies in my freezer for a quick gift anytime, and if the recipient isn’t home when I try to deliver I can just pop it back in the freezer and try again later. Plus the recipient can bake it whenever they’d like for a hot, fresh treat. NOTE: I got the idea for these jars and adapted the recipe from this post from Wendolonia. That post has a great formula/recipe if you’d like to make just one crisp at a time, and discusses using other types of fruit as well. 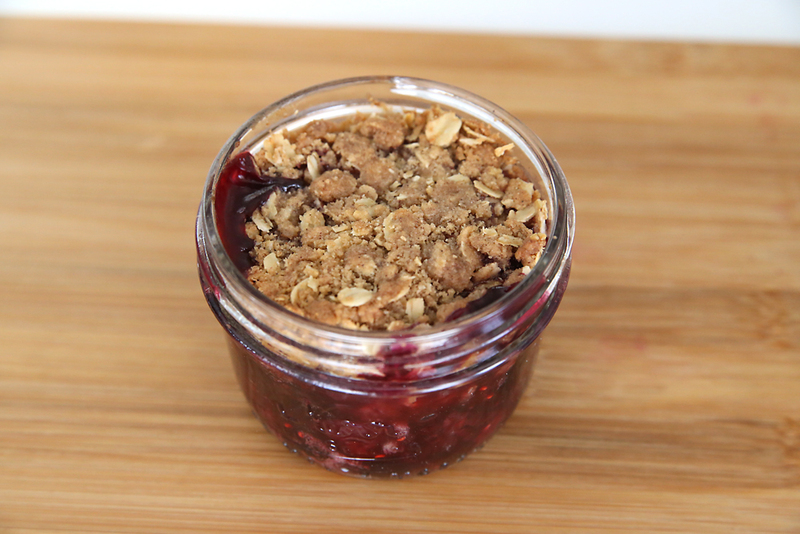 Since I think pie crust is kind of gross, I made triple berry crisps in a jar. 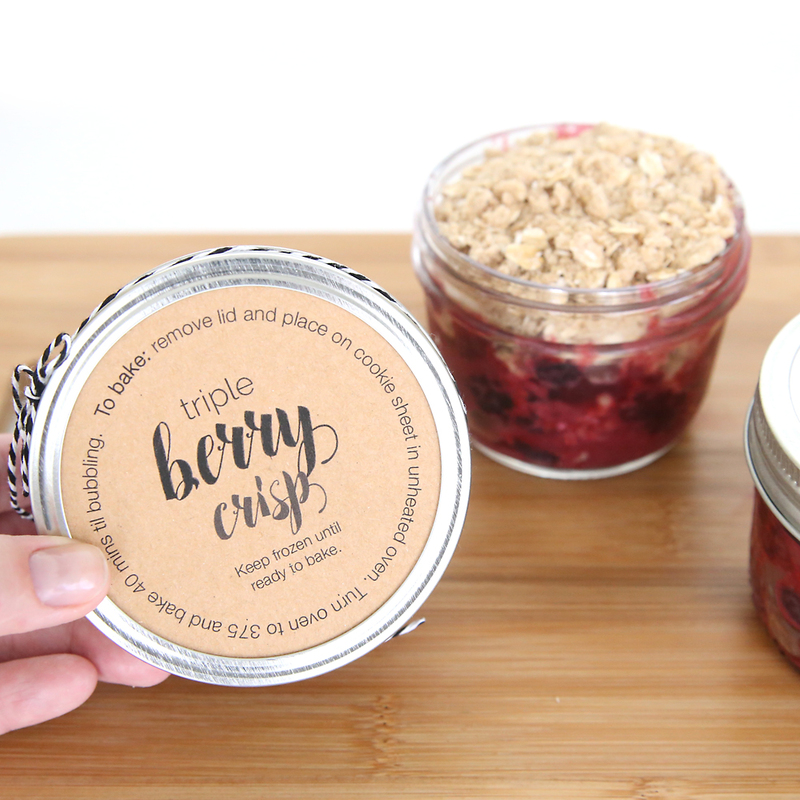 Each crisp is full of berries and an amazing buttery oat topping, all tucked into a 1/2 pint jar that can go straight from the freezer to the oven for a delicious single serving treat. I call it a single serving, but it’s actually pretty generous, so two people could share it, especially if they add a scoop of vanilla ice cream on top. They’re so good! I even made a set of printable tags that include the baking instructions. 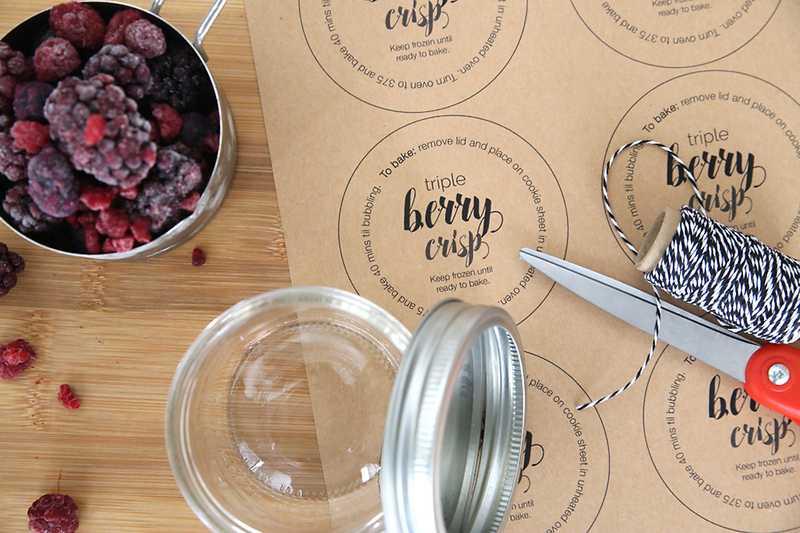 Here’s a quick video that shows how to put these mini berry crisps together. Following the video I have photos and written instructions, along with a printable recipe card at the end of the post. 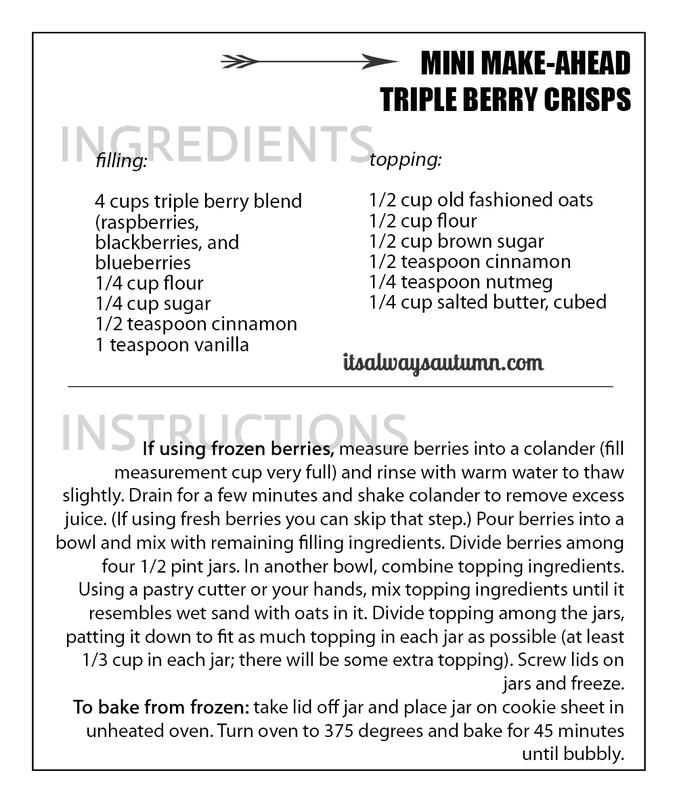 Since berries are so expensive for most of the year, I used frozen berries for these crisps, and they turned out delicious. I used a triple berry blend, which contains raspberries, blackberries, and blueberries. 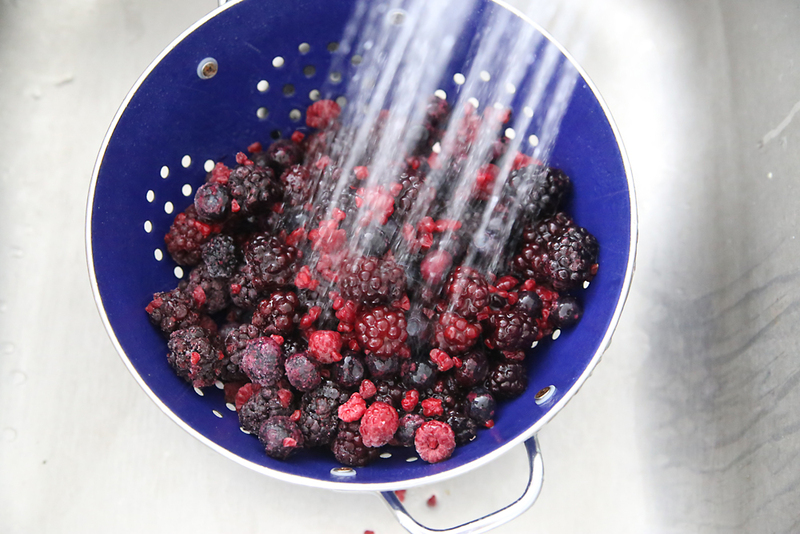 If you’re using frozen berries, make sure to fill your measuring cup very full, even a little over-full, since the frozen berries will lose a lot of volume as they cook. 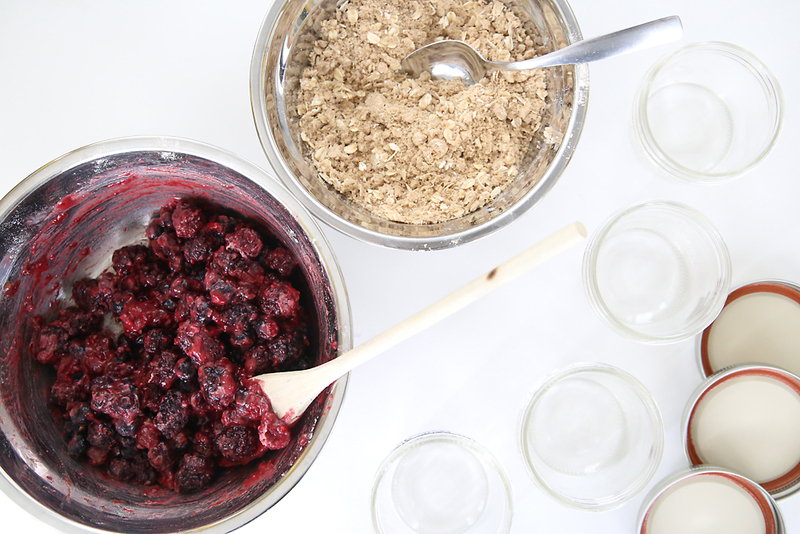 Then place the berries in a bowl and add the other filling ingredients (flour, sugar, cinnamon, vanilla). In a second bowl, mix up the topping ingredients (oats, flour, brown sugar, cinnamon, nutmeg, and salted butter). You’ll want to cut the butter into cubes before adding it to the topping, and then either use a pastry cutter to cut it in, or just use your hands to mix it in, squeezing the butter into the other ingredients to combine. When it’s done, the topping will look like wet sand with oats in it. Then divide up the fruit into four half pint jars. I used these half pint jars because they are short and squatty instead of tall and skinny, which makes them much easier to eat out of. Press the fruit down in the jars, and then fill the jars with topping. I like to press the topping down to fit as much as possible into each jar, because I love topping. 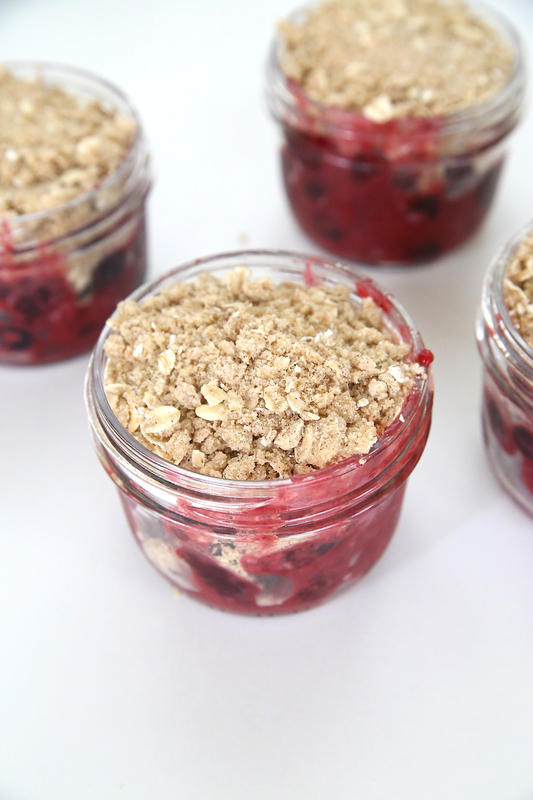 Make sure you get at least 1/3 cup topping in each jar. You’ll have some topping left over–you could cut up an apple, sprinkle the topping over it and microwave it for a quick baked apple treat! 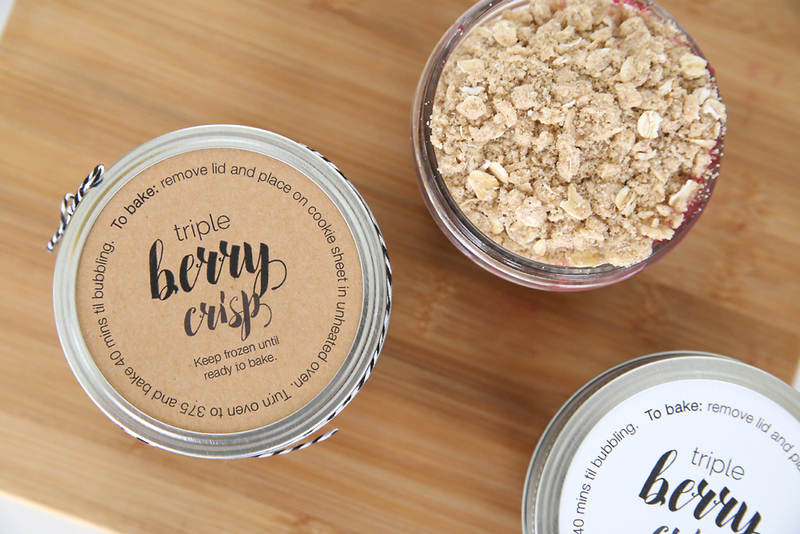 Once the jars are filled, screw on the lids, adding a printable label with the baking instructions on it. You can download the printable labels by clicking here. Make sure to print them out at 100% or full size. Then pop the jars into your freezer. Now you have four single serving berry crisps ready to go anytime you need a quick gift for someone, or just a treat for yourself. Baking is easy. 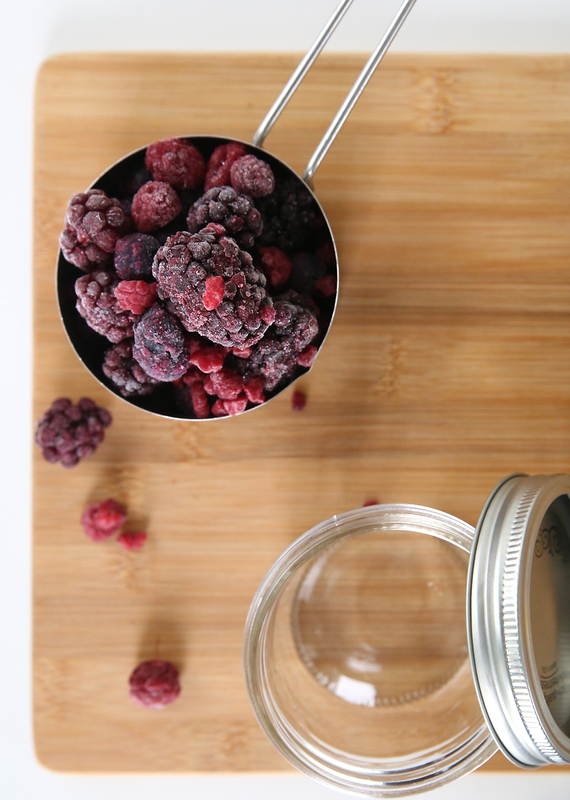 Just take a jar out of the freezer and remove the lid. Place on a cookie sheet in an unheated oven. Then turn on the oven to 375 degrees and bake for 45 minutes until the topping is browned and the fruit is bubbly. Placing the cold jar in an unheated oven and then turning on the heat ensures the jar won’t crack going straight from the freezer into a hot oven (since it’s a canning jar it probably wouldn’t crack anyway, but better safe than sorry). The only hard part will be actually giving these away instead of keeping them all for myself. Click here to download the printable recipe card. Click here to download the printable instruction labels. Click here to find the jars I used on Amazon. « 20 easy beginner sewing projects that turn out super cute! Love this. 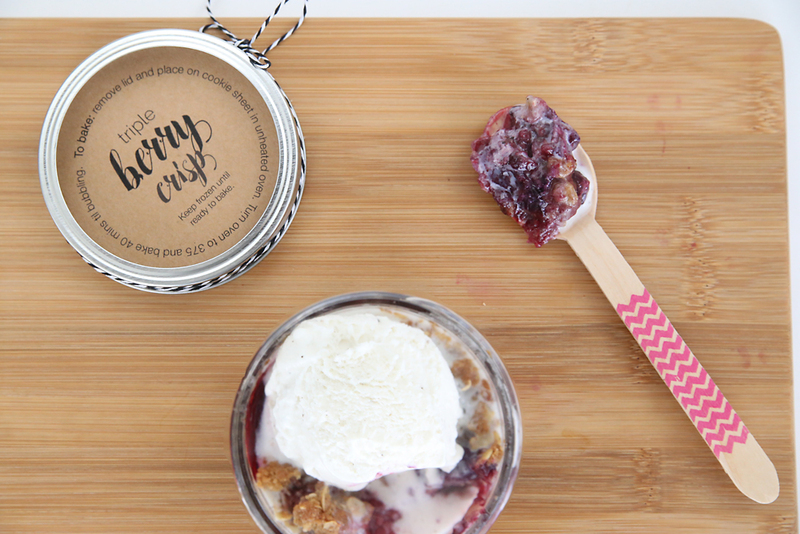 Thanks for sharing the recipe and the cute labels! what if I want to cook right away, not from frozen…what temp. and time then? You can still cook it at 375, and I think 30 minutes is probably plenty. Just watch it and take it out when the topping looks crumbly and the fruit is bubbling. Good luck! I made these to take around VT this month to my sisters I visit. I had some extra left over so I cooked one up to try it. It was DELICIOUS!!! 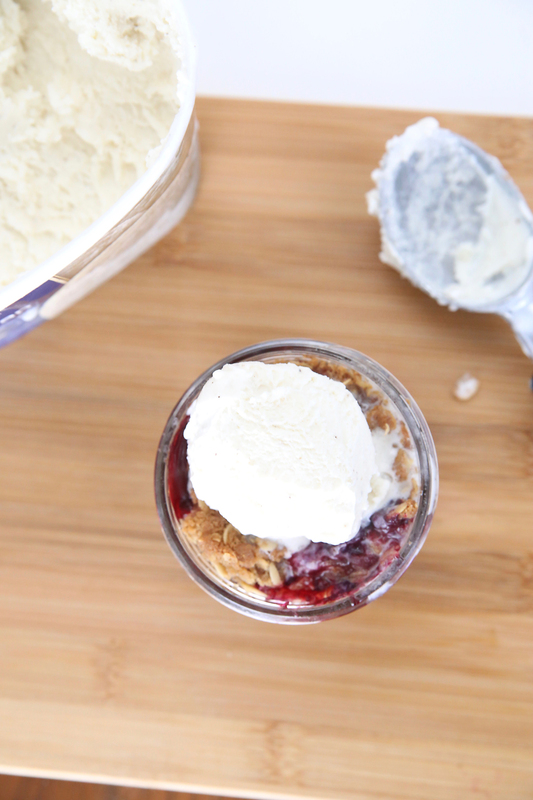 Thanks for the great recipe and for such a cute idea to give something yummy to people! Do I preheat the oven first or put the frozen container in hot oven?